Crude prices are currently $45.88/bbl this morning, down 2.5% from yesterday’s opening price of $47.04/bbl. Yesterday’s price movement ended the 8-day streak of rising prices. Prices opened this morning at $45.65/bbl, slightly higher than yesterday’s close of $45.13/bbl. 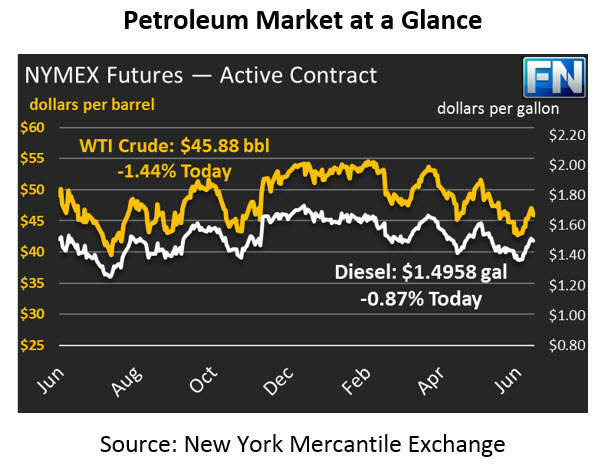 Diesel prices are $1.4960 this morning, up $.0173 (1.2%) from yesterday’s close of $1.4785. Prices opened this morning at $1.4921, roughly 2 cents lower than yesterday’s opening price of $1.5123. Gasoline prices are $1.5221 this morning, up nearly two cents (1.3%) from yesterday’s close of $1.5024. Prices opened this morning at $1.5205, down from yesterday’s opening price of $1.5340. Yesterday’s downward price movement seemed to be a market reaction to Russia’s announcement that it would not support a deepening of OPEC-NOPEC production cuts. Russia believes these would send a signal that production cuts are not sufficient. Prices received support from the API inventory prediction, which reported a larger-than-expected crude inventory draw of 5.76 million barrels. Markets will watch the EIA data this afternoon to confirm the inventory draws. Assuming EIA data is in line with API numbers, expect markets to rise slightly today.